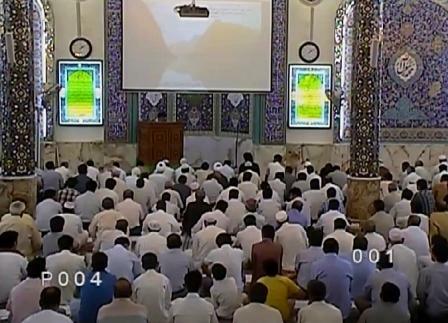 On 31st August, the Friday prayer was held in Imam Hussein (a.s) Mosque Dubai by Ayatollah Sey’yed Mahmoud Madani. The following is brief of the first sermon. In first sermon after Allah’s praise, encomium and reciting peace upon Mohammad (s.a) and his immaculate pure and chosen family he advised himself and all the prayers to have the Allah’s virtue and obtain the characters of righteous. He requested Allah to grant him and all the audiences the success to obtain the righteous characters and virtue. He continued his previous subject of virtue and obtaining the lessons from Amir-Al-Momenin (a.s) and told we reached to the sentence of the sermon of Mottaqin that says:” Va fez-zalazele vaqour va fel makarehe sabour va fer-rakhaehe shakour”. He explained that the life incidences are bitter or sweet and the coin of the life has two faces. One face is the hardness, problems and adversities of life. Amir-AL-Momenin explained for us that the righteous and faithful people are patient in these conditions. He explained that we already talked about that but if the life’s face changes to other side and the joy of life comes to us what should we do? He asked. He continued that the majority of people when the life shows its joy to them, strike by neglecting, conceit and arrogance. Amir-al-momenin says that the righteous people when the life comes to them and have the relaxation and softness of the life are self-collected that these graces are from God and know him and has his thankfulness toward him. He explained the word “Shakoor” means the one who thanks too much the God. He continued that if we are searching for practical exemplary we may review the life of Imam Hussein (a.s) to see how much hardness of life he has tolerated. He grew up in a family that most of the time there were not enough food to fill their hunger and most of the time his father was out for prophet’s battles against pagan and polytheists. His father used to be injured while still he has not healed up of previous injuries of the past battles. He lost his grandpa while he was a 4-5 years kid and accompanied his mother’s funeral while he was too young. Then he experienced his father’s martyrdom on that worse condition and after that the martyrdom of his elder brother. Consider all these tragedies and disasters in his life and look what he says in Arafa supplication. Ayatollah Madani continued that this great man by tolerating all of this hardness of life telling that O’ My Lord, how I can thank even one of your blessings that you have granted to me except that you should grant me the success of thanking you and in that case I should thank you for the achievement as well! He is the exemplary of the thankful person. Then he prayed that Allah grant all of us the achievement of thanking the blessings in the manner that he likes to be. After that he continued his regular discussion about the exemplary society. He told “last week we entered the discussion that what the exemplary family is.” He explained that he has already explained the exemplary son and daughter, father and mother. What we discussed was the individual duties of each member of the family. Now we will talk about the common duty of the family. What character should be in all the family members that make the family to grow up and to make the family be acceptable by Allah? This will be our discussion for these weeks. He added that I hope to be able to express in a way that is understandable by you. The relation between family members is according to loving each other. The members are connected to each other but what makes this gathering? If we look at the families we can recognize that some couples living beside each other only because the law made them husband and wife and they used to be live together. This kind of relation unfortunately is growing in modern families and they are in a family just because of an article of the law made them to be beside each other. I don’t like to disclose some truth about some families how they are living together how they have each one their own separate life but just the law making them a family and no other thing is in between. I found some statistics that the American officials has released in websites about the percentage of the couples and families that just living together because the law made them husband and wife and nothing else in between. The divorce also is illegal in catholic sect so they should live together as the law forced them to live. This kind of family never can be a succeed family. Actually at all this is not a family! Then he continued that sometimes the needs make people to live beside each other, specially the materialistic needs. The wife is just tolerating the living beside a man as her husband because of her expenses. If you ask her why you are living with your husband she will replay that anyhow you need someone to pay your life expenses. Or from other hand sometimes the man feels his wife is a good cook and patient nurse so he tolerates the life beside her as he needs a cook and nurse. In fact they are thinking the other side is their servant, the wife considers her husband as the one that should work out and bring money and husband thinking his wife is a maid to cook for him and wash the clothes and …. “This is not a succeed family” Ayatollah Madani continued. We have too many families that living together just because of their children and wife telling if there were no kids I never would stay with him even an hour and vice versa. Brothers and sister, what should connect us together in a family should be the love not the materialistic and economical needs or the kids. One of the prosperous family’s characters is that their connection is based on the loving each other and no other things. Then he brought some evidences from the narrated hadith that are mentioned in Vasayel-al-shia and told that Imam Sadeq (a.s) has told that “Whatever you love more your wife you have greater level of faith”. So the idea that some men think that they should have a very despotic manner out of any love and kindliness in family is not matching to this hadith. It will be even more, you are proud of your love to Ahl-al-bait (a.s). Imam Sadiq (a.s) has told “whatever level of love you have for us, have the same to your wives”. If we talk about the love of the ladies it is because the female nature is like that if receives love will respond with more love. Even more than these, it is not only the manner of the faithfulness but it is the manner of the prophets (a.n.v.a.s) on its highest level. Then he asked everyone to listen carefully as he was going to read a letter which has written by an Islamic leader to his wife. He continued: Imam Khomeini as a great leader which basically changed the structure of the political system of the present world and he was a very great philosopher, scientist and character went to Hajj pilgrimage and on his way wrote this letter to his wife and the letter has published by the Imam Khomeini foundation publishing. After writing the name of God and beginning the letter he has written “I love you, during the time that I am far from my darling and light of my eyes, all the time your beautiful face is engraved on my heart…” this is not a love letter or SMS from a young boy to his girl friend! This is not today’s literature but is a letter that has written by a great religious leader to his wife to learn us how to deal with our wives. It is not detraction for a great man to express his love to his wife. It is not detraction for a lady to be proud of her husband and express that” I love you and you are in my heart, I’m needful to you”. This has the root from the other place. The leader of the world’s free people in a poem has told “I love the house that my daughter and my wife are there; I love them and has no fear of the blame of others in this regard”. He continued that these are the love lessons and if a family has this will be a succeed family. Then he gave the example of the love of Fatima (s.a) toward her husband Ali (a.s) when she was in her worth situation after breakage of her flank and her discharge of baby, when she opened her eyes just asked where Ali (a.s) is? And not asked about her discharged child or her broken flank! Or has narrated that Ali (a.s) was sitting on his wife’s grave and mourning that if the enemy was not threaten the Islamic nation, I would sit here beside you till my death time! He added that these are exemplary families and our families should learn. We will explain ensha-Allah in coming weeks that this love can be created and even is not limited only to husband and wife. The children also should be involved. Children love for parents and parents love for their children. Regarding the kissing the hand of others it has strictly forbidden to do except for prophet and the Islamic scientists. Generally kissing others hand is prohibited in narrations from Ahl-al-Bait (a.s), but for children to kiss their parents hand is an exemption and even suggested to kiss the parents hand or even feet to show their love to their parents. Parents also should show their love toward their children. Ayatollah Madani continued that there is a narration from Prophet (PBUH) he was in visit of Othman-Bin-Madoun while he was hugging and kissing his kid. Prophet asked if you like him. He answered yes the prophet of Allah, prophet told if you like to know something that makes you love him even more? “Anyone loves toward a kid and the kid get satisfied of the love, Allah will make that person in last day to receive whatever graces he likes till get satisfied!” He continued see how Allah has opened the grace doors for us. He added that there are other Hadith that pointing the love of the family members like wife and kids is sword of Satin but it has explained by our leaders that the love toward the family should be in the defined limits of the Islam and logical and if changes to indulgence in love it will make them rude and they will go out of control and barefaced to do the sins. So there should be level for loving them and it should not excess the limits. He conclude his speech and told that in brief we told today that the exemplary society is beholden by exemplary family and the exemplary family is the one which not only the law or kids or economical reasons makes them to be in a family but also the Love toward each other is the main reason of being together. Then he explained that next Sunday is Uhud Battle anniversary and martyrdom of Hamze seyed-al-Shohada and he will explain more in next sermon in Arabic but he pointed that prophet (PBUH) liked to held up a Mourning ceremony for Hamze and blamed the Madina people that why there is no Mourning for Hamze? “Va laken le Hamza la bakia lah” After prophet speech, they used to have the Mourning ceremony in each death happened there first for memorizing Hamza Sayed-Al-Shohada and then for their passed person and that become a custom in Madina. But during the time it is forgotten and we wish to renew this Sonnat. So we will have the Mourning ceremony on Saturday night in mosque and Haj Feiz Abadi will have his speech there. He asked everyone even if not possible to attend to Imam Hussein Mosque for Mourning of Martyrdom of Hamza Seyed-al-Shohada, attend any nearby mosque and remind them about this Sonnat and try to renew this Sonnat beside the Mourning Ceremony of Imam Hussein (a.s) in everyplace. Ayatollah Madani finished his firat sermon and in second sermon he had his speech in Arabic.